Charlotte AutoFair - The Largest Collector Vehicle Event in the Southeast! Opens 8:00 AM to Public each day – stay as long as you want. No closing time. Tickets at Gate - $13 adult – Children 12 and under free. No Advance Tickets. Event is not open on Sunday in October. The Hornets Nest Region, AACA, produces the world famous and much celebrated Charlotte AutoFair Event in April and September each year on the grounds of Charlotte Motor Speedway. These events provide collector car Flea Market Vendor spaces to buy and sell restoration parts and supplies for almost any vehicle ever produced — in addition to Car Corral vehicle spaces on the track oval for buying and selling collector vehicles of all descriptions! The collector car Flea Market includes everything automotive, including memorabilia, vintage signs, tires, wheels, automotive toys, restoration supplies, tools, and classic cars for sale! HNR plans for more than 150,000 Eager Collector Vehicle Buyers and Restorers to attend Charlotte AutoFair! The April event will include about 10,000 assigned spaces and the September event will include about 7,000 assigned spaces. The Hornets Nest Region, AACA, has produced Charlotte AutoFair for more than thirty-five years to thrill auto enthusiasts from all over the world! You may shop freely between the Automotive Flea Markets outside the track and the Automotive Flea Markets inside. Use the Underpass Gate 25-26 to shop between outside and inside. Have your hand stamped if needed to leave Charlotte AutoFair and come back the same day. 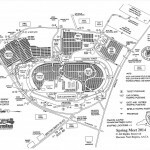 Parking for the September event is easy – take Entrance A or B from US Highway 29 into the speedway and park adjacent to the Green Field Flea Market. 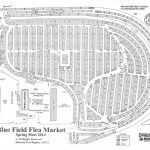 Check out the Green Field Vendors and then move into the Blue and Orange Field Flea Markets. Parking is also easy from Morehead Road – enter from that side of the speedway and you are immediately into the world of collector cars! Interstate 85 exit 49 is always very busy – recommend using US Highway 29 or NC Highway 49 through Harrisburg! Please note: Friday and Saturday are always the busiest days of Charlotte AutoFair! As with any large collector vehicle flea market, the Hornets Nest Region cannot require Vendors to attend or require Vendors to remain thru-out the event. Some Vendors will leave Saturday night and Sunday morning. The speedway will sell tickets at full price on Sunday even with many automotive Vendors absent. Please plan accordingly, especially if you are attending for the first time! April includes a National AACA Antique Vehicle Meet on Saturday. September includes a Region “Cruise-In” Thursday and Friday with a Region Car Show “Original to Custom” on Saturday. No admission fee – the speedway collects a parking fee. Plan well ahead for lodging in the area. Rooms are at a premium the same as found at other large venues. keep an eye on the weather and make your decision accordingly! Fall Charlotte AutoFair October 17-19, 2019: Purchase Vendor or Car Corral space now with the Vendor Registration form on this website – or phone the Region Office 704-841-1990. 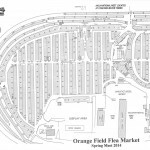 A very limited number of spaces may be available in the Blue and Orange Flea Market Fields – these fill up quickly. 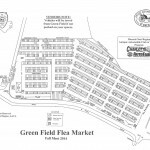 On opening day Thursday April 4, come to the Green Field Registration Tent to purchase Car Corral and Flea Market space in the Green Flea Market or Red Flea Market Fields. 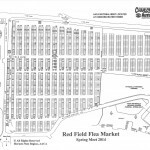 Some special parking locations are available for those who are buyers and want to be in the Blue Field, close to the Vendors, and therefore eliminate having to pick up parts after hours. Phone the Region Office for more info. 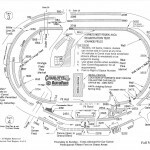 The Car Corral is an excellent method of selling a collector vehicle. Displayed at Charlotte AutoFair on the Track Oval, a Buyer can see the car up close, touch it, drive it, and talk with the Owner in person. No messy auctions or advertising to deal with! 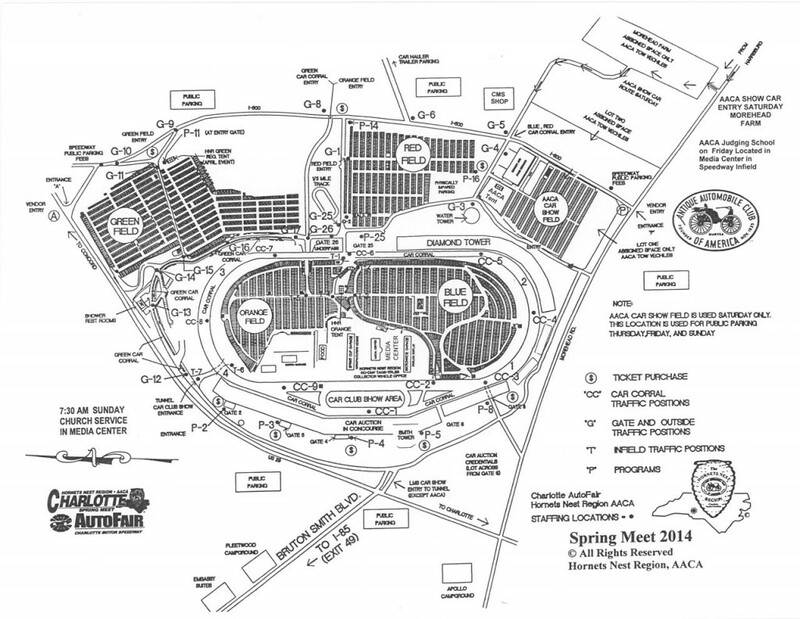 In addition, the AACA Spring Southeastern National Car Show will be held on Saturday April 6, 2019 in the ‘Fan Zone’ next to the main entry from Highway US29. All owners in the AACA National must be members of AACA - for info, phone the Region Office 704-841-1990. Produced by the Hornets Nest Region Since 1978 at Charlotte Motor Speedway.